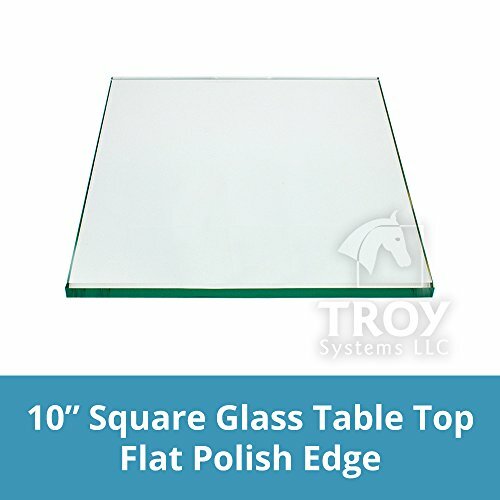 High-Quality Square Table Top Glass by TroySys Our square glass table tops are made of high-quality tempered or annealed glass in your choice of shape, size, glass thickness, and edge finish. Square glass table tops are suitable as a top for an existing pedestal or can also be used to sit in a frame or on a patio table top. If you're doing that, you'll want to choose a table with a flat polish edge or use as a table cover. In this case, the edge will be visible, so be sure to choose a nice edge like a beveled edge or a polished edge. This beautiful 10"" Inch square glass table top that can be used as a table cover to protect an existing table's surface or it can be placed on a pedestal to create an instant side table. Our square glass table tops are available in many sizes. Features: Shape: Square Thickness: 1/4” Inch Strength: Tempered Edge Work: Flat Polished Glass Type: Clear Glass High-quality Glass Get a high-quality glass with professionally finished edges, available in every size and shape you need. Manufactured by Troy Systems. Risk-Free Guarantee: We are so confident that you will be thrilled and delighted with the Troy Systems glass product. If we’re wrong, we’ll give you your money back. If you aren't overjoyed with your product and the results, we'll give you a full refund, no questions asked. SQUARE GLASS FOR TABLE TOP: Our square glass table top is 10 inch in size. Used as a glass table top or glass table cover for any existing table or base. Use our glass table top in several different ways. TEMPERED, ANNEALED, AND THICK SQUARE GLASS: Our table tops are made of high quality tempered or annealed glass, in your choice of shape, size, glass thickness, and edge finishes. Its given extreme heating and rapid cooling during its manufacturing. CLEAR & FLAT POLISHED GLASS: Glass is made of thick tempered clear glass with flat polished edges and eased corner. Every effort is made to hold the preferred dimensions for your glass table top or glass table cover. MULTIPLE WAYS TO USE: This type of glass is made for its superior strength and safety properties. You can use it in various applications such as a dining table, coffee table, in-home or at the office. Use it as to multiple ways. 100% SATISFACTION GUARANTEED: With FREE shipping and guaranteed "in-one-piece" delivery at your door. Tabletops from TroySys are the best way to get what you need instantly. Get the high-quality glass with professionally finished edges. If you have any questions about this product by TroySys, contact us by completing and submitting the form below. If you are looking for a specif part number, please include it with your message.